After having worked together in Shop Nimba for a year, former pupils of Centre Nimba decided to try and become independent. And it works! Kadialou repairs radios (his wish come true). Fatoumata works as a hair dresser. Bangoura works in a sewing shop and sells smoked fish together with her mother. Kadiatou is doing a secretarial course. Mariama continues her schooling with secondary education. 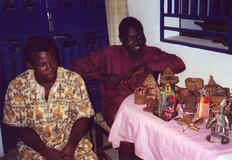 Oumar and Sanou run a workshop together and sell homemade clothes and other homemade things. Thanks to Nimba these children have a future!